: Board Collector: A bit of focus. I just had a few beers with my friend Sam in New York. She told me a story of a guy she went on a date with in Texas who was a geologist of sorts who studies dirt. Nothing else just dirt. I asked why she stopped seeing him "was it because of the dirt?". She said no, she admired his focus on just the dirt, the dirt was good, it was 'cause he was a bit dorky. I got back to my room to an email from Tim in Hawaii. 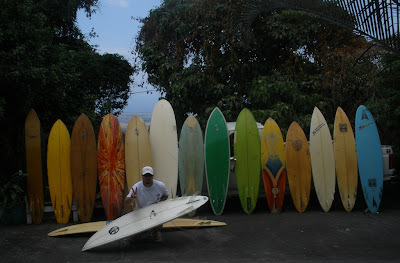 He's been working hard all day shaping a board he dreamed about last night. A beautiful Bonzer. It appears that's all he dreams about, beautiful Bonzers. 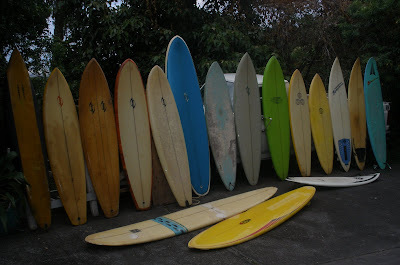 He has amassed a wonderful collection detailing the history of Bonzers. And that's what we admire, a bit of focus!